Normally I would make my blog pictures upstairs on my pink blankets. 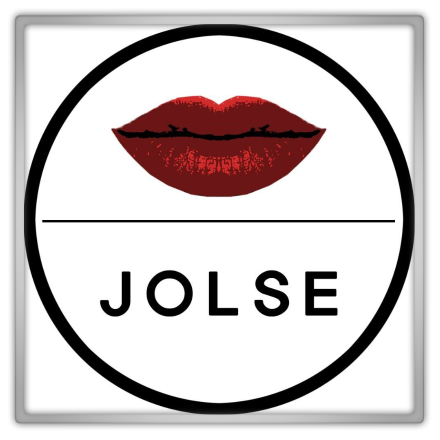 This time I was (like always) excited to receive my Jolse order, but a bit too hasty and not careful. While opening my package I've ripped one of my masks over with the scissors xD So I had no other choice than to take pictures right away and use the mask right away :) Ready for the review! The mask includes ingredients such as vanilla, shea butter, honey, milk, almond, collagen, and Polynesian lagoon water. It will make your rough foot moisturized and soft like baby skin. Each pair consists of two sheets and each sheet contains 13 grams, total 26 grams per pair. Since the sheet is flexible, you can do study or house choirs while wearing the masks. Wear the socks type masks on your foot. Remove the sheet after 10 minutes. Recommended use 1-2 times a week. If necessary, you can increase the frequency. I wanted to use this mask right away because I'm not sure what happens if you wreck the packaging, will it dry out or go bad? So that evening I've used this foot mask. I've made a huge discovery for myself. Last time I've used a peeling foot mask I wondered after a week why only one side of my feet was peeling. Apparently there are 1 socks in one. The plastic outside and some kind of fabric sock on the inside which adherence tightly around your feet. Silly me :P I've found that this foot mask was less slippery than all my other foot masks I've tried, but the amount of product in the mask is the same. Sadly the scent wasn't how I hoped it would be; body shop shea butter scent. 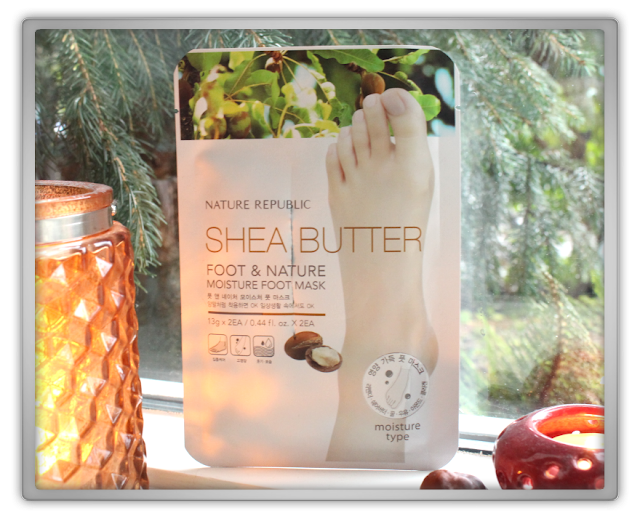 I can't describe the scent, It's good and nice, but I always hope for that specific scent when I see the words shea butter :P My feet felt nice and moist after. They say use 1-2 times a week, well if you want to keep your feet moist then yes do that. The nice moisture only last for like 2 to 3 days. It's a nice foot mask, is it epic? ; no, it's just good. I like the Holika Holika foot mask way more! Gloves type exfoliating mask. 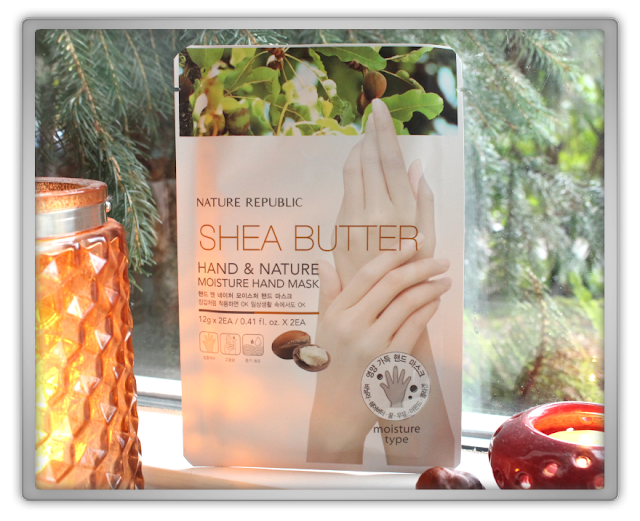 Nourishing vanilla, shea butter, honey, milk, almond make dry & rough hands to be radiant and smooth. Outside coated fabric with excellent adhesive power enables to wear during daily life. Collagen creates moisturized and smooth skin like baby's skin. Cleanses the hands and separate both sides of mask pack. Wear to both hands like wearing gloves and remove after 10-15 minutes. Make the remainder essence absorbed. While I was wearing my foot mask I've decided to also use this mask. Very stupid idea because I was organizing a binder with mail I had laying around. When you plan something like this; make sure you bind the gloves tight to your wrist with a elastic band or something. They constantly crept up. 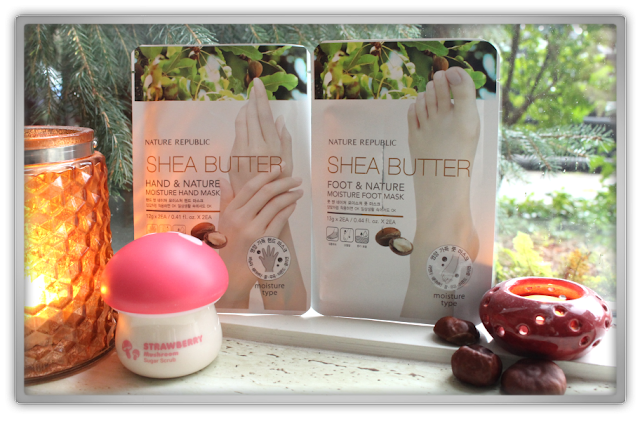 The scent is the same as the foot mask, soft and nice, but not like the shea butter scent from the body shop. I think I prefer the foot mask from this line. After I've removed the hand mask, I felt my hands were old and wrinkly and after a while they didn't felt moist. It was more like my hands had still a layer of moist around it. So I'm not sure what to think of this mask. Mega Tripler mushroom’s moisturizing (Pine, shiitake, chaga mushroom) Pore and dead skin care with Nutritious Mushroom CARE. Strawberry seed & Sugar ingredient are contained for old dead skin cell with moisturizing effect. Soft sugar gel like strawberry smoothie. Dead skin cell sugar scrub. Massage dried face (no moisture) with body temperature. If you want mild dead skin clearing, use this on moist face! I wanted them all (pff, the hoarder in me!) 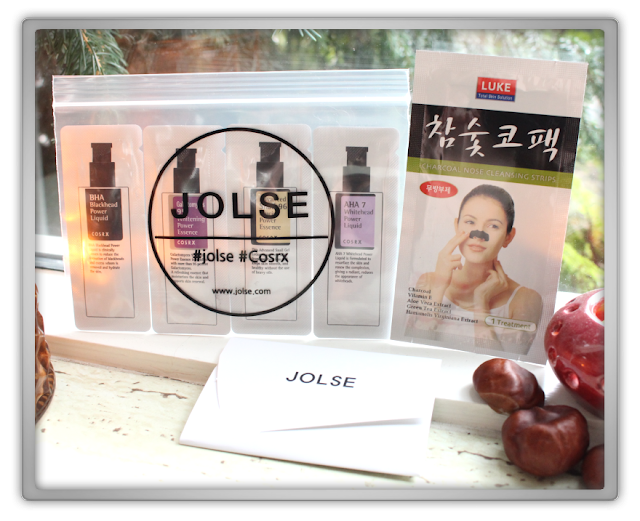 But I stayed strong and said to myself; What will you really use right away...The Mushroom pore pack; Just bought myself the Innisfree pore pack which rules! Mushroom sleeping pack; You kinda never use sleeping packs and when you do you use one from memebox or the Laneige water sleeping mask. 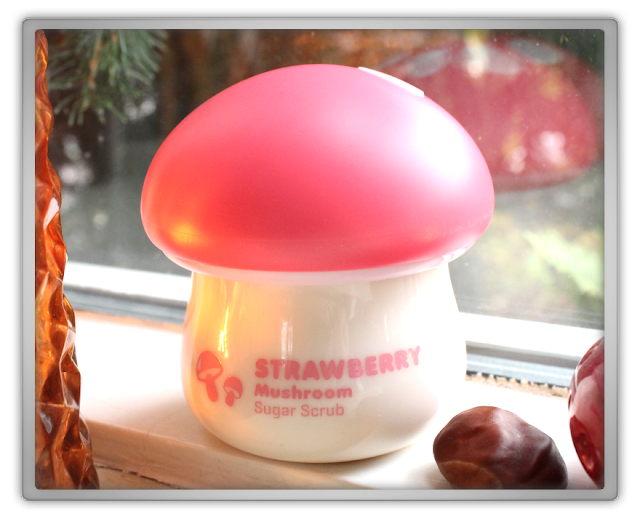 Strawberry scrub; I LOVE SCRUBS AND STRAWBERRIES... I've made my choice! That's kind of how I think ;) Best choice ever! This stuff is amazing and smells so, so, so good! It's like not organic strawberry jam with sugar and also like water strawberry ice creams. It's sticky jelly stuff but mixed with water it's slippery jelly. It's leaves you skin so, super duper soft and when you scrub it doesn't hurt at all. It does leave you skin perfumed for like 5 to 10 minutes after you've used it. Personally I think that's very cool but I'm not so sure it that is a good thing, but I don't care ;) I only scrub my face when I shower because I can be very messy. This strawberry scrub stands on my sink in my bedroom, I only use scrubs outside the shower when I think it's a favorite, easy usage, and worth it to make a mess;) I will repurchase this for sure! I super duper recommend this product! 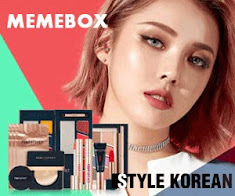 This is one of my most favorite Korean online beauty stores! I recommend you really take look! They have very affordable prices, awesome deals, free shipping worldwide, and they are super sweet!! They have "Happy Together Sale" with 12% off everything + 3% store credit + Extra 5% off Etude House Weekly Sale! !